4. 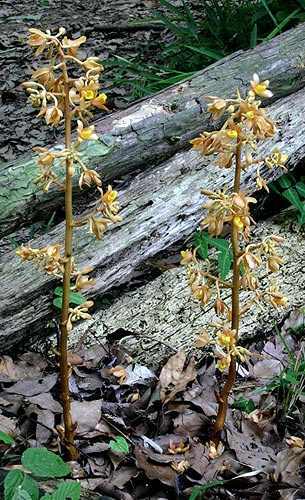 While its flowers are large and showy, they difficult to see in a woodland setting. This seeming contradiction only makes sense when you see the plant in person. It is easiest to find when in the fall when the fruit have matured rather than when in bloom, for despite their lovely coloration the flowers are difficult to see. The large bunches of banana-like fruit, however, can be seen from a great distance. 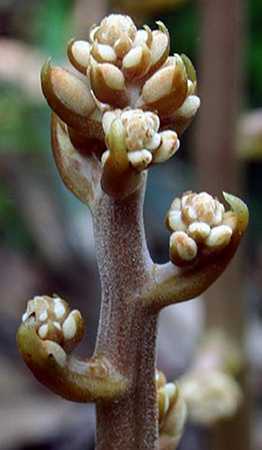 Even the emerging flower stalk with its bunched buds is interesting and novel. In the old days it was used as a medicine (perhaps the seed pods), and was supposed to have a diuretic effect. Even the long seed pods are large. This one is just a month old. It will get much larger by fall. The mature seed pods of Cyrtosia septentrionalis are the most visually striking part of this plant. 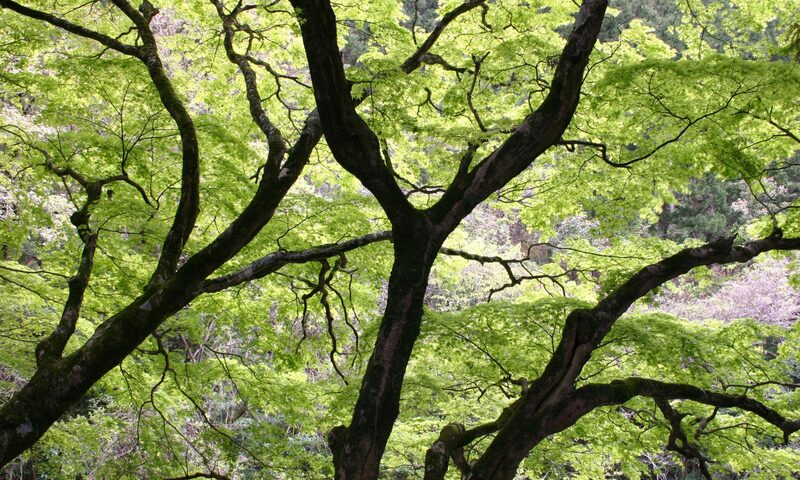 One other interesting story about this plant is its Japanese name, tsuchiakebi, meaning “earth akebi”. Akebi is a vine who’s Latin name is Akebia quinata, known commonly as “chocolate vine” in the west. 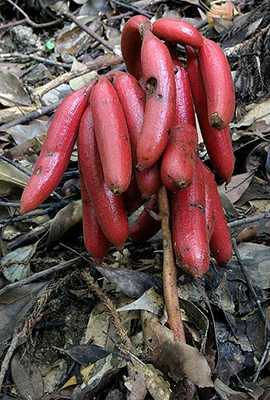 A. quinata produces large purple-red fruits in the fall at the same time as the orchid. These fruits are a delicacy. Since the orchid’s fruits grow directly out of the earth with no leaves, it got the name earth akebia. I’ve seen no record of them being used as food however. The relatively large winged seeds of Cyrtosia septentrionalis are some of the largest in the orchid family. 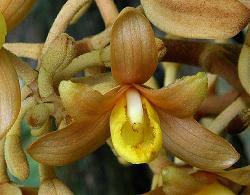 Though lovely, this species is not in cultivation due to its saprophytic nature. Technically these plants are in fact ecto (outside) parasites (living off another organism’s energy). To wit, the orchid lives off the fungus, and the fungus lives off dead organic matter or living plant tissues (most often roots). 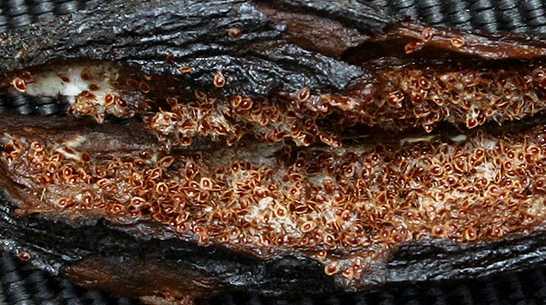 Research has been done to identify a least some of the fungus symbionts for this species. Perhaps one day if the fungus and orchid can be successfully cultivated together we can have these strange and beautiful plants gracing our gardens. A section of the seed pod of Cyrtosia septentrionalis. As you can see, the seeds are large for an orchid. What a fascinating article! 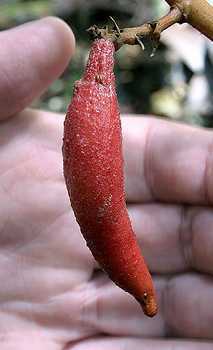 I study Galeolas in the Himalayas and though they are striking, none have such magnificently coloured fruits. Can fresh seeds be available? I’m glad you enjoyed the article. G. septentrionalis certainly is easy to find in the fall months. Unfortunately, in the past few years the colonies I know of have been ravaged by wild boar and were either killed or eaten. This orchid is not very common locally, but can be seen in just about any mature woodland, so there is hope. Seed is not dispersed in the wind like most orchids, so finding some in good condition well into the winter months is possible. I did read on the internet your article about Galeola septentrionalis. I was wondering if you can help me, with getting seedpods of the mentioned orchid in your article, Galeola septentrionalis. I am experimenting to grow saphrophytic orchids in vitro and to test a theory I have, how to grow them in pot culture. At the moment I am growing Limodorum abortivum with succes in vitro and Neottia nidus-avis. Further I just did sow Corallorhiza trifida and I am about to receive seed of Corallorhiza maculata. This mentioned species would be a great addition for my experiment and see if globalwide, there is a key point to grow saphrophytic orchids in pot culture, instead of being bound by surrounding forest, from which mostly these species derive their source of existence. I would be very thankfull if you can help me further. Fascinating to see that this species has established itself in Pennsylvania. It will be interesting to see if it becomes a problem plant or behaves itself.